You are probably well familiar with the 80:20 rule, or Pareto Principle, where 20 percent of the work is responsible for 80 percent of the results. There are many ways to restate the principle, but the important thing is that we know what the “big rocks" are that we need to move, that we can differentiate them from the “small rocks" and that we prioritize our project work accordingly. The reality is that most of the results we get will be from moving those big rocks but that we also need to move lots of the small rocks to keep things moving ahead. One trick is to find ways to get the big ones done and find ways to squeeze in and sprinkle our plans and days with the little ones too. When you think of “stuff not fluff" and catch yourself and shift gears onto more priority tasks, it boosts your confidence and effectiveness. And when you do that as a routine where “stuff not fluff" becomes part of your mantra, or part of your being, you will truly impart this on your team members and those that you lead. And effectiveness and productivity will climb with no additional effort! In other words, don’t fall prey to the distractors that are competing for your time and attention – ask yourself periodically, “Stuff or fluff?" And when you choose what you will spend your time working on, also ask, “Stuff or fluff?" In the end, it’s most important to ask yourself if something will matter at the end of the day end of the week end of the month end of the project end of your life! Are you working on “stuff not fluff"? 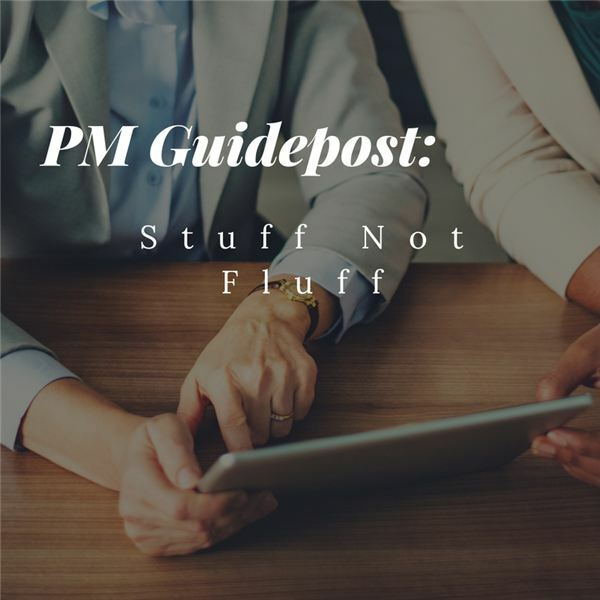 A series of four articles on PM guideposts or short little phrases that are power packed with wisdom to keep you and your team focused and on track. These are meant to be practiced in the middle of the day, middle of the week, or middle of the project.